The crew of the Apollo 1 was killed when a faulty electrical connection sparked a fire in the pure oxygen environment. 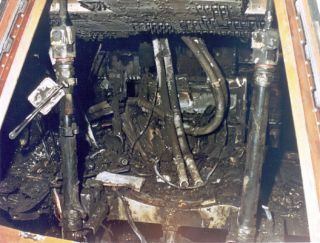 In this historic photo from the U.S. space agency, this close-up view of the interior of the Command Module of the officially designated Apollo/Saturn 204, but more commonly known as Apollo 1, shows the effects of the intense heat of the flash fire which killed the prime crew during a routine training exercise. While strapped into their seats inside the Command Module atop the Saturn IB rocket, a faulty electrical switch created a spark which ignited the pure oxygen environment. The speed and intensity of the fire quickly exhausted the oxygen supply inside the crew cabin. Unable to deploy the hatch due to its cumbersome design and lack of breathable oxygen, the crew lost consciousness and perished. They were: astronauts Virgil I. "Gus" Grissom, (the second American to fly into space) Edward H. White II, (the first American to "walk" in space) and Roger B. Chaffee, (a "rookie" on his first space mission).